The Jewish community of Livorno was founded relatively late. In 1593 Grand Duke Ferdinand I of Tuscany issued a favorable charter known as the Livornina, which allowed anusim (those forced to abandon Judaism) who wished to return to Judaism to settle in Livorno and Pisa. They were guaranteed full religious liberty, and even the possibility of receiving Tuscan citizenship. Livorno became the largest Italian town in this period without a walled ghetto. The local Sephardim excelled in business and industry. 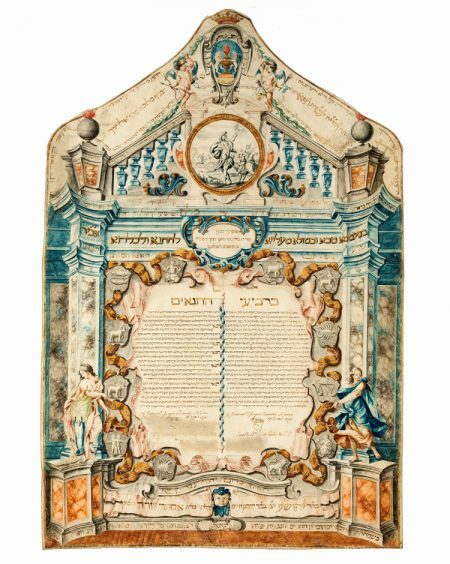 Ketubbah decoration for members of the prosperous Sephardic community of Livorno reached its height during the eighteenth century. A talented artist in the field of ketubbah illustration decorated this contract. A Baroque entryway, with a grand balustrade above, frames the two sections of the text: the ketubbah proper at the right, and the conditions at the left. Two massive pilasters are colored with patterns imitating luxurious marble. Unlike the decorations in the ketubbot of most other Italian towns, the architectural forms created by Livornese artists were portrayed with harmonious detail and the illusion of depth. Two dramatically posed female figures stand on plinths in front of the pilasters. Their hands point toward a gold ribbon that flutters within the architectural frame. The ribbon is inscribed with Genesis 1:27–28, the first commandment to Adam and Eve to be fertile and multiply. Within the ribbon’s folds are cartouches with the twelve Signs of the Zodiac painted in grisaille, which create a trompe l’oeil. The undulating borders around the text enhance the illusionistic effect that it is written on a separate parchment added to the decoration. Surmounting the marriage contract is a crowned shield with the Recanati family emblem flanked by cupids carrying symbols of love, a bow and arrow, and a burning torch. Another feature personalizing the ketubbah is the careful selection of verses along the border and in the large medallion beneath the shield. Referring to the bridegroom Joshua Recanati, the medallion depicts in grisaille a scene of Joshua commanding the sun to stand still, accompanied by the corresponding verses from Joshua 10:12–13 inscribed in gilt letters along the outer ring.